The Measurement of time exposition contains elementary time-measuring devices, like sundials, waterclocks, fireclocks, hourglasses and mechanical clocks, as well as electric and electronic devices, and finally, clocks based on quantum principles. 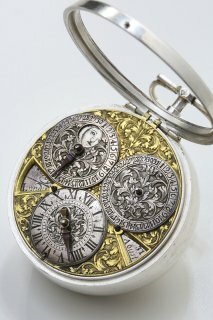 The exposition covers domestic development of clocks, whose beginnings are documented as far back as the Luxembourg monarchy. During the 19th century, technology in this country kept pace with the newest technological advancements in the field. Much of this was the due to the efforts of Josef Božek and Josef Kossek, and their work is presented here. A significant part of the space is devoted to the technology of clock-making. Visitors may examine a rich assortment of watch-making tools and fixtures. Part of the exposition is an audiovisual projection room, with an evocative film showing the phenomenon of time in far-reaching contexts.